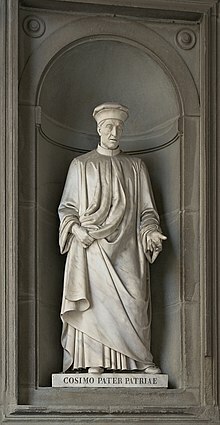 The House of Medici (English: /ˈmɛdɪtʃi/ MED-i-chee or UK: /məˈdiːtʃi/ mə-DEE-chee, Italian: ) was an Italian banking family and political dynasty that first began to gather prominence under Cosimo de' Medici in the Republic of Florence during the first half of the 15th century. 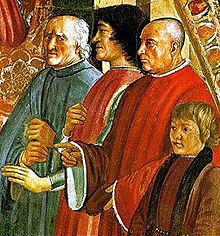 The family originated in the Mugello region of Tuscany, and prospered gradually until it was able to fund the Medici Bank. This bank was the largest in Europe during the 15th century, and it facilitated the Medicis' rise to political power in Florence, although they officially remained citizens rather than monarchs until the 16th century. 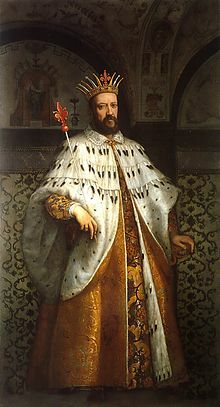 The Medici produced four Popes of the Catholic Church—Pope Leo X (1513–1521), Pope Clement VII (1523–1534), Pope Pius IV (1559–1565) and Pope Leo XI (1605)—and two queens regent of France—Catherine de' Medici (1547–1559) and Marie de' Medici (1600–1610). 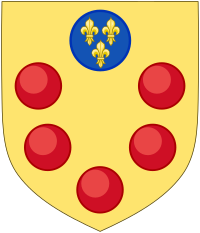 In 1532, the family acquired the hereditary title Duke of Florence. In 1569, the duchy was elevated to the Grand Duchy of Tuscany after territorial expansion. The Medicis ruled the Grand Duchy from its inception until 1737, with the death of Gian Gastone de' Medici. 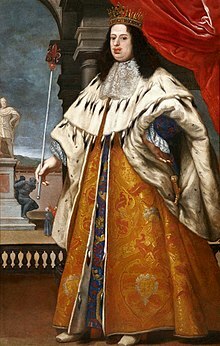 The grand duchy witnessed degrees of economic growth under the early grand dukes, but was bankrupt by the time of Cosimo III de' Medici (r. 1670-1723). The Medicis' wealth and influence was initially derived from the textile trade guided by the wool guild of Florence, the Arte della Lana. 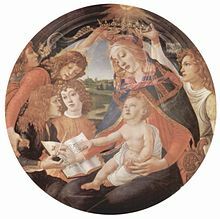 Like other families ruling in Italian signorie, the Medicis dominated their city's government, were able to bring Florence under their family's power, and created an environment in which art and humanism flourished. 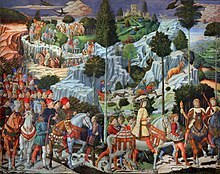 They and other families of Italy inspired the Italian Renaissance, such as the Visconti and Sforza in Milan, the Este in Ferrara, and the Gonzaga in Mantua. 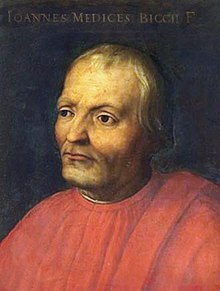 The Medici family bankrolled the invention of Piano and Opera, funded the construction of Saint Peter Basilica and Santa Maria del Fiore, and patronized Leonardo, Michelangelo, Machiavelli and Galileo. They were also protagonists of the counter-reformation, from the beginning of the reformation through the Council of Trent and the French wars of religion. ↑ Litta, Pompeo (1827). Famiglie celebri italiane. Medici di Firenze. ↑ Luisa Greco (22 May 2015). 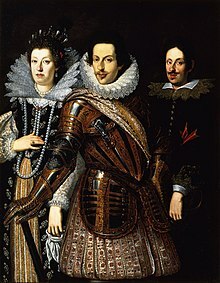 "Cosimo de Medici e l'amore per le tartarughe con la vela". Toctoc. ↑ "Medici Family – - Encyclopædia Britannica". Encyclopædia Britannica. Retrieved 27 September 2009. ↑ Malaguzzi, Silvia (February 24, 2004). "Botticelli. Ediz. Inglese". Giunti Editore – via Google Books. ↑ The name in Italian is pronounced with the stress on the first syllable /ˈmɛ .di.tʃi/ and not on the second vowel.How to say: Medici, BBC News Magazine Monitor—MED-uh-chee in American English. ↑ Crum, Roger J. Severing the Neck of Pride: Donatello's "Judith and Holofernes" and the Recollection of Albizzi Shame in Medicean Florence . Artibus et Historiae, Volume 22, Edit 44, 2001. pp. 23–29. ↑ Ulwencreutz, Lars (November 30, 2013). "Ulwencreutz's The Royal Families in Europe V". Retrieved 20 September 2018. ↑ Halvorson, Michael (2014-08-29). The Renaissance: All That Matters. Hodder & Stoughton. ISBN 9781444192964. 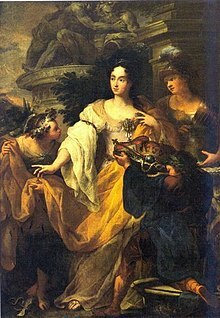 ↑ "Anna Maria Luisa de' Medici – Electress Palatine". Retrieved 3 September 2009. ↑ Two more brothers unknown. ↑ de Roover, Raymond (July 31, 2017). The Medici Bank: Its Organization, Management, Operations, and Decline. Pickle Partners Publishing. pp. note 1. ↑ Mackworth-Young, Rose (29 March 2012). 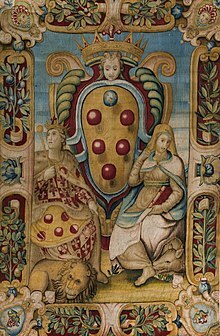 "The Medici balls: Origins of the family's coat of arms". The Florentine. Florence: B'Gruppo Srl (160). Retrieved 17 October 2017.